With the holiday season upon us, we know many members of our community will celebrate the season by helping provide meals to local people in need. Below we’ve answered some common questions from people who want to help by hosting a food or fund drive. Who receives the food that I donate? Our partner agencies. We distribute food to local food pantries, soup kitchens, shelters, schools, senior centers, and other community partners throughout our 34 county service area in central and eastern NC. The majority of these agencies are completely run by volunteers and many of them are only open a few days out of the month. Furthermore, they typically do not have the necessary resources or infrastructure needed to consistently collect, store, and distribute large amounts of food. As a result, many of them turn to the Food Bank as their primary and most reliable source of food. These agencies are a value to us as well since they are located within the local communities and have strong personal ties with the children, seniors, and families they serve. What kinds of food items do you need? Nutritious food. While shelf-stable items are still a staple in many households and are appreciated by our community partners and clients, we also stress the importance of fresh, nutritious food donations to ensure the health and well-being of those we serve, especially children. Donations of fruits, vegetables, and canned food that is high in protein and low in sodium are highly encouraged! Items that we cannot accept due to food safety regulations are non-perishable items in glass containers and non-perishable items that do not have the nutrition label with ingredients listed. View and print our complete list of most needed items here. Should we collect food or money? While we always welcome food drive donations and know that food drives are a great way to get your whole community involved, we can do a lot more with monetary donations. We have great buying power thanks to our strong partnerships with local grocery stores, farmers, and other retailers that allow us to turn every $1 donated into $10 worth of food. Do y’all provide food other than canned items? Yes! When people think of food banks, many immediately assume that they only distribute canned or boxed non-perishable food. But we make it a priority to provide as much fresh produce, meat, dairy products, eggs, and bread as possible. In fact, half of what the Food Bank of Central & Eastern North Carolina distributes is perishable! Thanks to our strong partnerships with local farmers, packers, and retail stores, last year we distributed more than 19 million pounds of fresh produce! Are you able to get perishable food to people before it spoils? Yes! Perishable food does pose logistical challenges to our operations, but we have great staff members and partner agencies that accept and distribute the fresh food quickly and efficiently. We also have huge coolers, freezers, and even refrigerated trucks to make sure the food stays safe to eat. While we’re on that topic, food safety is very important to us, to our donors, and to those we serve. We are inspected by Feeding America and AIB every two years and have unannounced visits from NCDA, USDA, and the FDA to make sure our facilities are operating correctly and safely. Our agencies and all of our operations staff are certified in ServSafe food handling. For example, meat must be factory sealed, processed at an approved facility, and frozen before expiration so it can be safely provided to those in need. As mentioned above, we handle a lot of produce. Most of it comes in bulk and our volunteers inspect it to ensure good quality before it goes to our partner agencies. How are you able to distribute so much food? Our volunteers. The amount of hours donated by volunteers each year at the Food Bank doubles the power of our staff. Volunteers sort all of our produce, eggs, and food drive items to not only ensure the items are safe to consume, but also to help break them down into manageable, family sized portions. Volunteers also provide key support in other areas of day-day operations such as front desk administration, database management, and fundraising. Without them, our work would not be possible. 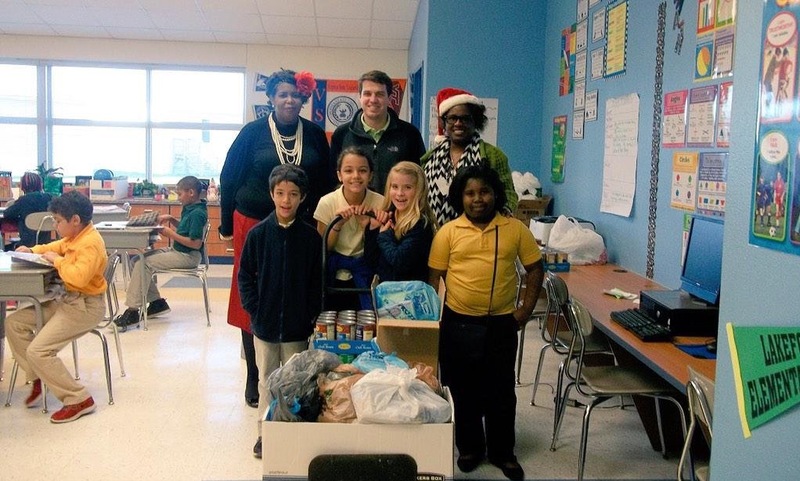 Thanks so much to our generous donors who help put food on the table during the holidays! To sign up to host a food drive, visit our website at www.foodbankcenc.org/FoodDrive. To make an online monetary donation to help us provide holiday meals to people across central and eastern NC, visit www.foodbankcenc.org/HolidayMeals. Look what your donations helped us accomplish in 2016!